St. Cloud, MN – The 2017 Northwoods League Champions, St. Cloud Rox announced their first three returning players for the 2018 season today. 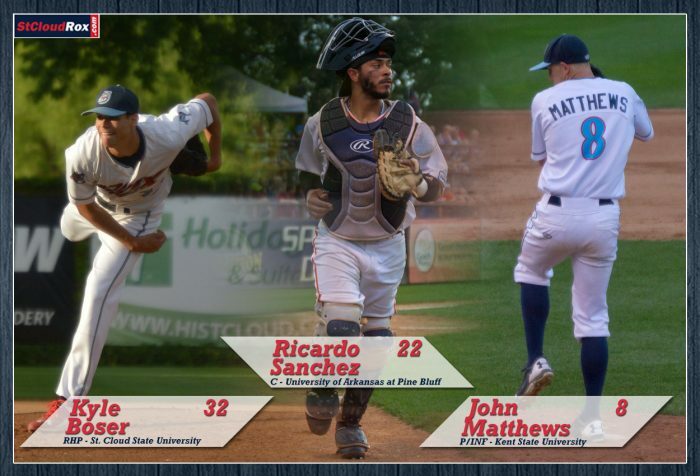 The returning players include pitchers Kyle Boser, catcher Ricardo Sanchez and infielder/pitcher John Matthews. Boser, a junior right-handed pitcher at St. Cloud State University, returns following the 2017 season where he pitched in 20 games for the Rox. He compiled a 3-1 record with a 2.25 earned run average over 56 innings pitched. During the 2017 Summer Collegiate World Series Boser appeared in two games where he pitched 6.1 innings, not allowing an earned run. Sanchez is a junior catcher at University of Arkansas at Pine Bluff. He saw action in 32 games for the Rox during the 2017 season. He finished the season with a .305 batting average with 2 homeruns and 15 runs batted in. Sanchez was a key piece of the Rox postseason run where he a .467 batting average with a homerun, five runs batted in and three runs scored in four games and was named the Rox postseason Most Valuable Player. Matthews, a sophomore right-handed pitcher and infielder from Kent State University, returns after seeing action in 28 games for the Rox in 2017. He appeared in 12 games on the mound, all in relief. Over 16.1 innings pitched, Matthews posted a 1-1 record with two saves, thirteen strikeouts and a 2.20 earned run average. At the plate, he had thirteen hits and five runs batted in. Director of Baseball Operations Augie Rodriguez, Field Manager Al Newman and the Rox organization will continue to build the roster for the 2018 season. The Rox will play their 7th season of Northwoods League Baseball in 2018. The home opener at Joe Faber Field is schedule for Friday, June 1st at 7:05 pm against the Mankato MoonDogs. Full and Partial Season tickets and group ticket packages for the 2018 season are currently on sale. For more information regarding this release please contact the Rox front office at (320) 240-9798 or visit www.stcloudrox.com. The St. Cloud Rox are a member of the finest developmental league for elite college baseball players, the Northwoods League. Entering its 25th anniversary season, the Northwoods League is the largest organized baseball league in the world with 20 teams, drawing significantly more fans, in a friendly ballpark experience, than any league of its kind. A valuable training ground for coaches, umpires and front office staff, more than 185 former Northwoods League players have advanced to Major League Baseball, including three-time Cy Young Award winner Max Scherzer (WAS), two-time World Series Champion Ben Zobrist (CHC) and MLB All-Stars Chris Sale (BOS), Jordan Zimmermann (DET), Curtis Granderson (LAD) and Lucas Duda (TBR). All league games are viewable live via the Northwoods League portal. For more information, visit www.stcloudrox.com or download the new Northwoods League Mobile App on the Apple App Store or on Google Play and set the Rox as your favorite team.